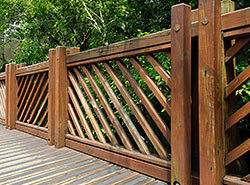 Most homeowners are particular about the kind of fencing they choose. Almost everyone will want some or the other type of fence on their property and this is one of the first things they install when they move into their new home. This fencing may be specifically for a security while at other time, it might be just a border that demarcates a property. If you want any kind of fence, you will have to ensure that you are choosing the right material and that you are getting it installed from a reliable and expert company like California Creations. 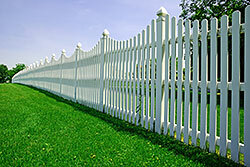 Wood - When one thinks of a wood fence, one of the first things that comes to mind is a picket fence. There is something very quintessentially quaint and homely about a picket fence and it has an airy & informal feel to it. But wood fencing is not only about pickets. 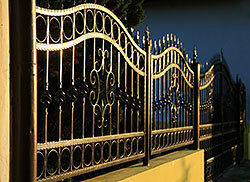 Wrought Iron - This is another classic material for fencing. It has a distinct old world charm about it, looks decorative and provides a very effective security barrier without really blocking the outside view, in the manner that wood fences do. Wrought iron fencing can be customized to your liking and it can also be designed to match the main gate and gate posts if you have or are planning on having them. Vinyl - This is another great fencing option. It is popularly used as an alternative to wood. At the outset, it was manufactured to mimic wood and provides a similar effect at a much lower cost. Today, you will find a range of colors and textures in vinyl fencing and it can make your property look cheery and bright. If you like picket fences, but do not want to use wood, opt for vinyl fencing. It looks good, lasts long and does not get affected by the weather. California Creations has years of experience with handling all type of landscaping and construction work for residential and commercial customers. When you come to us with your fencing requirement, the first thing we try to understand is what the objective of having that fence is and where it is going to be positioned. Once we have ascertained this, we will then provide you with the perfect option. Contact us on 818-083-1213 or use this online form to send us your fencing query.